“Instant Inspirations” is my series for you if you look for something to overcome “Photographer’s Block” or simply want to shoot something that you have never tried, or at least not recently. Episode 28 is for you, if you think you have those really steady photographers hands. Last night I grabbed my camera and headed into town, using a short window where the rain of the last days actually stopped – here in Nuremberg we can still dream of a White Christmas, but it won’t happen. Forecasts call for a real wash-out. Global warming? 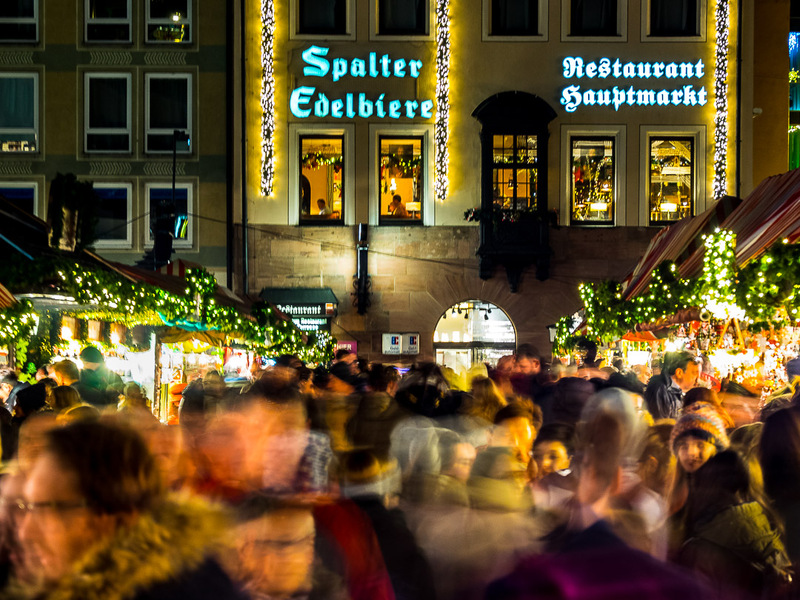 The Christkindlesmarkt in the Old Town was packed with visitors, as everybody used the opportunity for Glühwein and Bratwurst without getting soaked. 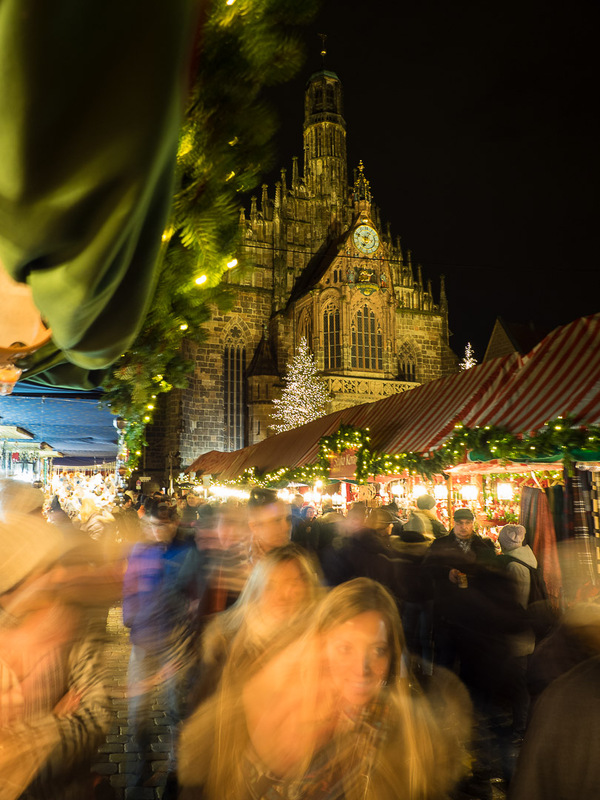 While I did have Glühwein and Bratwurst, my real goal was to experiment with slow shutter speeds, and doing this handheld. And I mean reeeally slow shutter speeds, as in one and a half seconds. I wanted to capture the motion blurred movement of the strolling visitors, while keeping the stationary background sharp. I was shooting with the Olympus OM-D E-M1 with my trusted all-round 12-100mm F/4. This lens has actually built-in image stabilization, that can be combined with the camera’s internal 5-axis image stabilization. With this cam-lens combo I frequently do shoot 1/5 sec and know that I can get real sharp results. But 1/5 sec is not enough to capture the motion blur I was after. So I was doing trial and error shooting while slowing down the shutter speed even more. Isn’t that creative, experimental approach something that makes photography even more fun? I feel like a little child doing playing in my photographic sandbox. In the end I found that dialing in a 1.6 second shutter speed gave me the best results. One point six seconds. Count slowly “Twenty-one, twenty…”. And this while holding the camera above my head using the foldable back screen to compose. I was totally amazed that the wooden stalls and the buildings in the background actually came out pretty sharp. I know I have steady hands when photographing, but would never have thought I can get away with shooting one and one half second and get a sharp background. But see yourself. Amazing technology. The above photograph I had in mind taking when heading into town. 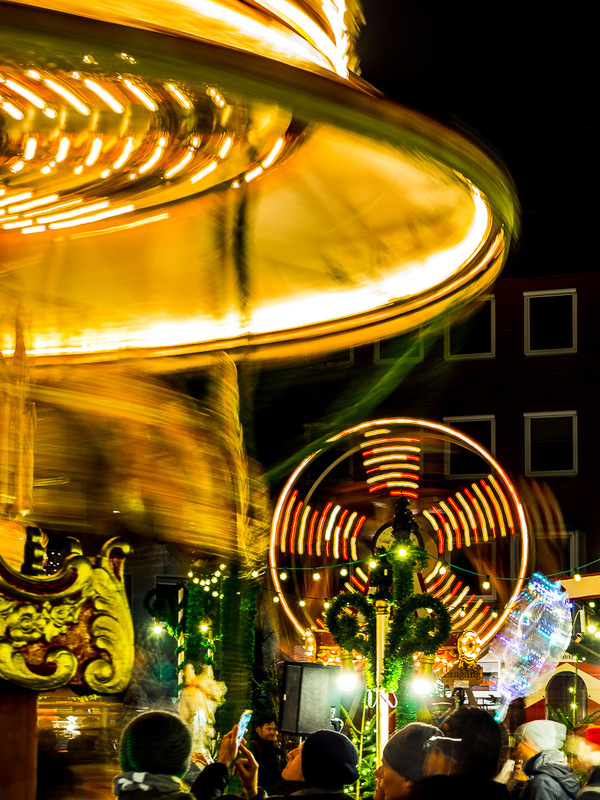 I knew that on the Children’s Christmas Market was a carousel and a little ferris wheel, I wanted to combine the vertical and horizontal motions into one motion blurred image. Also this one I shot holding the cam above my head. I was quite happy with the results, although using this technique is a lot of hit and miss. But hey, that’s why we shoot digital. Obviously, you can use a tripod to achieve the same effect, probably with better and much more consistent results. But in certain situations, like on a packed Christmas Market, there is no way to set up a tripod, so this technique comes in quite handy. If you feel inspired to take your camera and experiment with handheld shooting at very slow shutter speeds, post the links to the results in the comments below. A lot of other tips and all previous episodes of my Instant Inspirations around photography you can find in my free Learning Center. Wish you a great start into a creative weekend! Nice, though I suspect I don’t have stable enough hands to pull it off! I sooo want to do this, but perhaps one of my New Year resolutions should be to learn what my camera can actually do. Well done Marcus, quit an achievement. And you obviously didn’t have too much Glühwein. Frohe Weihnachten und einen guten Rutsch. Very nice stuff! Breaking the “rules” quite often lead to great discoveries. Awesome images. Season’s Greetings Marcus. That’s just crazy… 1.6 seconds, hand held. nice shot, Marcus. You got the horizontal and vertical motions, for sure. I do love motion photos like this. Sometime mine happen….due to operator error… But these are wonderful, Marcus. Have a wonderful Christmas. What fun photos! I think it captures the excitement of a Christmas market! We are still be fully drenched in rain, but I’m looking forward to some moments of dry to get out and capture some things. I’ve been pretty remiss and dealing with other stuff. No white Christmas for us either (except the dirty patches of snow left from the massive snow a few weeks ago 😉 ) Have a wonderful weekend Marcus!! You’re an amazing photographer, and by far the best street photographer out there! Happy holidays and I’m looking forward to seeing your work in 2019!